by Ben Zimmerman BS, MS in psychology with emphasis in behavior analysis. There are many considerations that can affect your therapy sessions. It is important to optimize as many conditions as possible to provide the maximum gain for patients. The topics in this article include an introduction to reinforcement, handling potential reinforcers during therapy, optimizing oral and tube feeds, and how to assign practice for the home. The approach I use for feeding therapy is a behavior based one, but this article should prove useful to anyone conducting feeding therapy. Many therapists use reinforcement procedures to increase the frequency of eating behaviors. A reinforcer is any stimulus or condition that is presented subsequent to a behavior (e.g. mouth openings), which as result alters the probability of that behavior occurring in the future. An example is presenting a toy (reinforcer) after a mouth opening. If afterwards mouth openings occur more frequently, then bite acceptance is considered to have been reinforced. Different reinforcers have different values at different times. It is important to maximize the power of your reinforcer used during your sessions. An establishing operation (EO) is any condition that alters a reinforcer’s effectiveness. If there is constant access to a reinforcer, then using it as part of treatment may prove unfruitful. Not having access to a particular toy outside of sessions will increase the likelihood of that toy reinforcing your target behavior. Limiting the toy access within your session will help ensure that the toy continues to have a reinforcing effect throughout your session. A good way to do this is by using a timer during each presentation. When the timer goes off the reinforcer is removed. Using a timer also makes the removal predictable for the child, which minimizes any potential crying that can result initially from reinforcer removal. Although hunger is not always readily seen as an EO when dealing with feeding disorders, it nonetheless serves as an important variable when dealing with both volume and variety. It is therefore always prudent to limit intake prior to a session. The instructions that I give to parents are no solids less than 3 hours prior sessions, no drink (other than water) less than 1.5 hours prior, and no water less than 1 hour prior. I have found that doing so also drastically reduces emesis in children who vomit frequently. There are two popular approaches to handling enteral feedings during treatment of tube dependence: (1) bolus additional needed hydration and nutrients right after a treatment session and (2) space enteral feeding as far away from treatment sessions. Therapists who advocate for bolusing right after treatment argue that doing so further satiates the child. That satiation is then paired with the oral feed, serving as a reinforcer for oral consumption. Other therapists recommend waiting as much time as possible subsequent to sessions before using the tube to make up the intake. The argument made for this approach is that the effect of satiation can spread to both the tube feed and the oral feed. 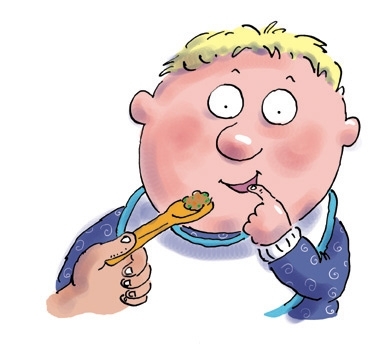 The implication is that if bolusing occurs right after oral feeds that the child can get confused as to what caused the satiation. In my experience spacing the tube feeds as far as possible from the oral ones is the most effective strategy. I also try to condense as many of the tube feeds overnight in an attempt to minimize amounts given by tube during the day. Some therapists believe that progressively assigning protocol components used in treatment is the optimal way to promote normal mealtimes. While this strategy holds true for many other behaviors, I have not found this to be the case with eating. The way I handle therapy is by quickly getting eating to a satisfactory level (based on goals set prior to treatment). Once eating behaviors are stable I train parents and caregivers to implement the protocol that was devised for their child. Doing so minimizes any negative carryover effects to sessions that may occur as a result of practice at home. That doesn’t mean that practice at home cannot occur. I just prefer not to take chances. You can always make a salient distinction between your sessions and assigned homework. Using a different spoon, practicing in a different room (if treatment is in the home), practicing different tasks, using different verbal prompts, and using different reinforcers are good examples of changes one can make. Effectively using reinforcers, meal schedules and practice can greatly enhance your therapy sessions. For more information on feeding disorders you can visit www.pediatricfeeding.com . Ben Zimmerman BS, MS in psychology with emphasis in behavior analysis.